Its been such a long time since I’ve made a baby quilt for no reason at all! Its so relaxing after doing lots of large quilts since they go together so quickly. Especially when using an easy pattern that I’ve made before (this pattern). Love that. The colors in this quilt are picked out of that Riley Blake Bloom and Grow fabric (the vines)…I bought mine here a while back, but you can also find it in other colors here. Aw, this is the sweetest quilt! I just love the colors, which fit perfectly with the name you gave this one. I really want to try this pattern… someday! I like this pattern, too. I just might have to try it out next! 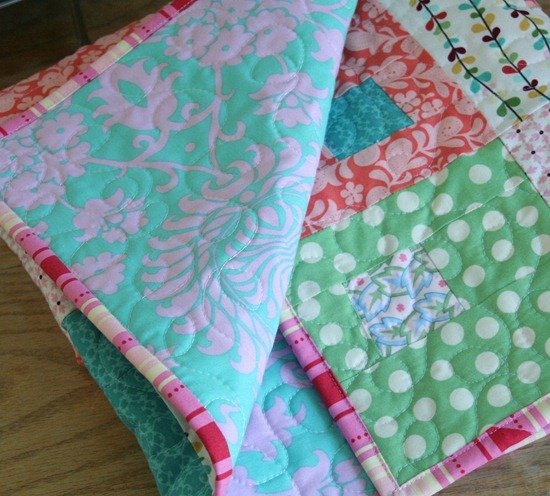 so cute, love the fun colors and the loopy quilting. Hopefully I'll get to try out some fun quilting soon! 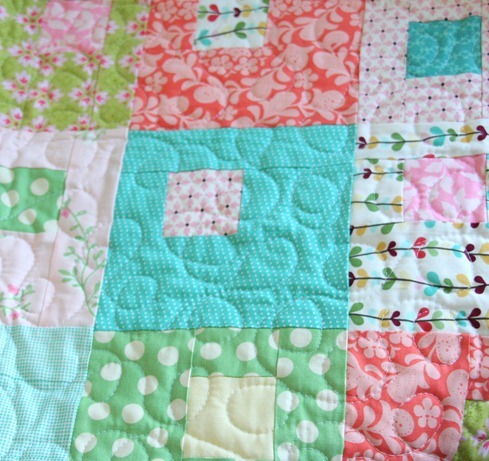 Oh I love that baby quilt and the quilting is AWESOME!!! Ohh how lovely!! I love ALL the fabrics! Those vines by Riley Blake and the Henna Garden is such a perfect combination. That is darling! It's fun to put together a small quilt here and there…the (almost) instant gratification thing. Beautiful colours and love the loopy quilting. Darling darling darling! Did I mention it's DARLING? K sorry to go all comment crazy on you but I am in LOVE with this. The colors and fabric choices are amazing!